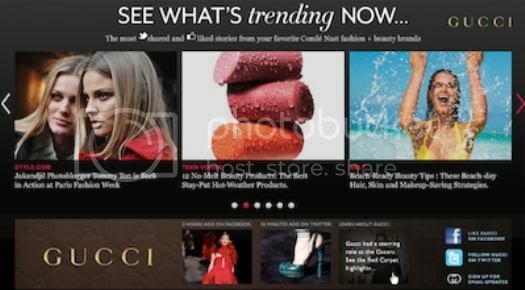 The publisher of such titles as W, Style.com, Glamour, Self, Teen Vogue and Lucky, is giving readers a new way to share content and see which stories are trending - sponsored by Gucci. Social Sidekick launches today and Gucci will have the exclusive sponsorship for the next two months. For the user, the feature isn't incredibly groundbreaking, but for brands it holds some promise as a way to instantly target offers that are tailored to the content readers are engaging with. Gucci's contract gives the label first right of refusal to renew once the two-month launch period is up. Here's what Condé's Social Sidekick looks like..
Are sponsored features the social media version of the advertorial? Only time will tell, but look for more of them from traditional publishers looking for new ways to keep readers and provide added value to advertisers.